On May 31, 2017 at about 11:10 AM, the Sprint store located in the 3500 Block of Oaklawn Avenue was robbed at gunpoint. Two suspects held the employees at gunpoint and took merchandise from the store. The employees were not injured during this offense. Suspect #1 is described as a Black male, 30-40, 5’10”, 200 lbs wearing a red shirt, black pants, and a camouflaged boonie/military hat. Suspect #2 is described as a Black male, 6’1”, 280 lbs, wearing a dark shirt, dark shorts and white baseball cap. 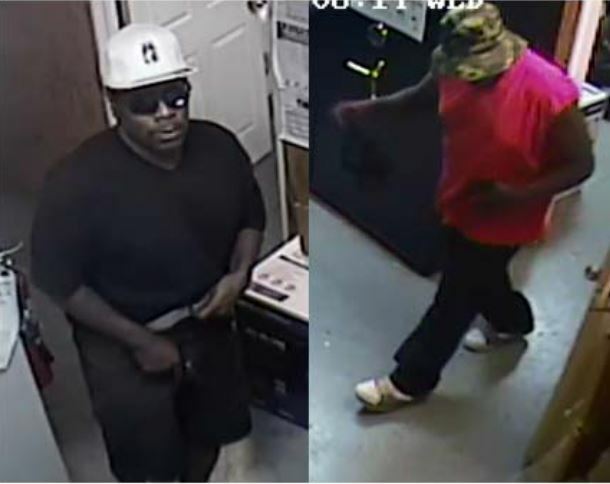 Anyone who recognizes these suspects or has information concerning this offense is asked to contact Detective Stokes at (214)671-3444.